Nashville, Tenn. (July 17, 2014) – Country music powerhouse group RESTLESS HEARTis bringing its rich, soaring harmonies to Gaylord Opryland’s A Country Christmas with the all-new A Season of Harmony Dinner Show. 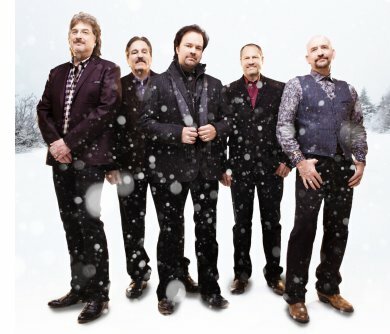 Known for chart-toppers like “The Bluest Eyes in Texas,” “I’ll Still Be Loving You,” “Why Does It Have to Be (Wrong or Right)” and “When She Cries,” the band—celebrating 30 years with its five original members—will perform holiday classics and original songs from its new Christmas album, A Season of Harmony, as well as favorite hits. Gaylord Opryland’s A Country Christmas kicks off mid-November with Restless Heart performing nearly 30 live A Season of Harmony Dinner Shows leading up to Christmas. Held in the iconic 2,882-room hotel’s Tennessee Ballroom, each show will include a four-course meal prepared by Gaylord Opryland’s award-winning chefs. Larry Stewart, John Dittrich, Greg Jennings, Paul Gregg and Dave Innis, the men who make up Restless Heart, have enjoyed one of the most successful group careers in Country music history. The band has placed over 25 singles on the charts, with six consecutive #1 hits, four of their albums have been certified Gold by the RIAA, and they have won a wide range of awards from many organizations, including the Academy of Country Music’s (ACM) “Top Vocal Group” trophy. Restless Heart is currently on the road celebrating their 30th Anniversary and will perform over 120 live dates by the year’s end.